The Abby Locksmith store, conveniently located. Enjoying a recent facelift and redesign, and conveniently located on South Fraser Way at unit #120-33258, the Abby Locksmith retail store is a bustling and welcoming hub: servicing walk-in residential customers, folks wishing to have automotive chip keys programmed, and commercial and strata clients placing orders or seeking advice. The showroom spotlights some of the latest in mechanical and electronic locking hardware, fire and burglary safes, and security accessories. In the background is the hum of key cutting machines, providing home, RV, boat, motorcycle, cabinet, and new Transponder automotive keys to customers while they wait. Abby Locksmith offers prices comparable to hardware stores, while providing a much wider range of products and solutions, with an extensive onsite inventory to choose from. Over a century of experience is vested with the owners and staff, who are always on hand to respond to questions. The friendly team is highly relatable, taking the time to hear clients’ needs, and respond without mystifying technical jargon. 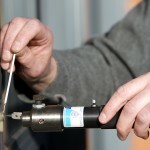 Located at unit #120-33258 South Fraser Way, and open five days a week, the Abby Locksmith retail store site offers ample parking, and even dining options within footsteps, for people wishing to grab a bite while they have their keys cut or lock cylinders replaced.